This fund was started in the year 2009. Many deserving and meritorious students are pursuing their professional courses. At present 26 students are helped under this fund. Ms. Tejaswini. B L has completed MBBS course from Bangalore Medical College and doing her internship. Shri. Nithin N Shenoy is doing his final year MBBS Course at MVJ Medical College. This year 3 students are doing MBBS Course at Raichur Medical College, Ambedkar Medical College respectively. Among 5 students who have completed Bachelor Degree in Engineering, two students have selected in Accenture and Shapoorji Pallonji Construction Company respectively. This programme was started in the year 1992 for a small group of children. In the beginning 4 children were assisted for education and now it has gone up 115 Children. Children studying in 2nd standard to 5th standard are assisted under sponsorship II and those who are in 6th to 10th standard come under the sponsorship I programme. This year 14 children have appeared for 10th standard examination and 4 children have passed in first class and 6 children passed in second class. They have joined PUC taking various streams. 60 children were helped to buy books for college. 3 children have completed their degree. Educational Sponsorship III (erstwhile De- Institutionalizing Programme) which is in its 22nd year, continues to focus on the education of children. 35 children are being offered educational sponsorship support and live with their families. All the children are in their middle and high schools, one girl has given her 10th std exams and one boy is in his 1st year degree. Annual get together programme for the children sponsored under the project was held on 4th Feb 2017. Donors of the project attended the programme and got an opportunity to meet the children sponsored by them. 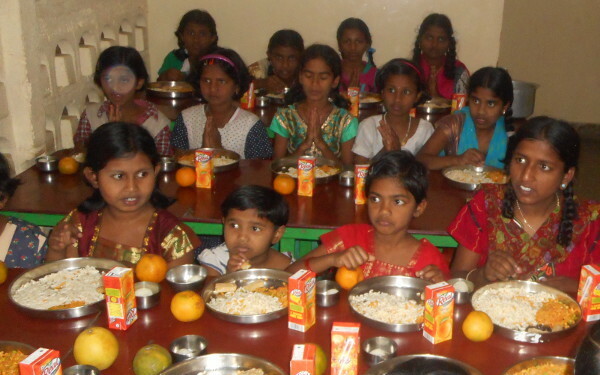 Lunch and gifts were given to all the sponsored children. We express our sincere gratitude to Mrs. Sureka and Dr. Niranjan Raju of USA, KRS Educational Society USA, Mrs. Sunila and Mr. Deepak Benegal, Singapore and other individual donors for their continued support which has helped us to reach out to children from under privileged backgrounds and enabled them to live with their families and enjoy their childhood. Taegutec India Private Limited Bangalore, under their education scheme called “SHIKSHAK SCHOLARSHIP” has sponsored 5 girls for Pre University Education. Three students were pursuing II PUC at MLA PU college, one student at Mount Carmel College and other student at Vision P U College. Ahalya Endowment fund continues to sponsor the five girls studying in High School and colleges. One girl has appeared for her 10th standard exams, two have appeared for their 2nd year P.U.C exams and two girls have written their 1st P.U.C exams. Get together programme for these five girls was organized on 4th Feb 2017 along with the children from educational sponsorship III. Participation gifts were given to all the children. The Rotary Club of Bangalore provides sponsorship assistance to six children. One boy passed his 9th std and is in 10th std, 2 girls and 2 boys completed their 1st year Pre University with first class marks and are in their 2nd year, one girl has given her 2nd year Pre University exams and is awaiting results. Balika Shikshana Samruddhi Scheme is an Educational Sponsorship Scheme extended to girl children studying in high school i.e. 8th, 9th and 10th standards at Government and Corporation schools in the State. This scheme was extended to reach children from the 10 districts - Bagalkot, Belgaum, Chitradurga, Davangere Dakshina Kannada, Dharwad, Haveri, Kodagu, Tumkur, Shimoga, and through our District Councils and committees. 90 children have benefited from this scheme for the year 2016- 17. 14 children are under this sponsorship programme. 12 children are in middle and high school and 2 children who are doing BCA and CPT & Law are given extra amount towards their college fees. All are doing well in their studies.